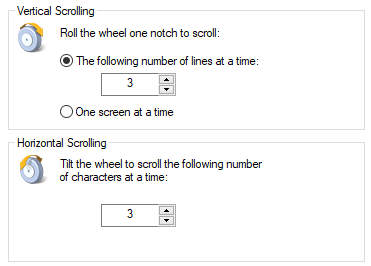 In outline mode the mouse scrollwheel very beautifully allows vertical thought by thought scrolling. Can we add the Page Up / Page Down key functionality to animate up/down a screen page of thoughts? This would be useful when browsing through a bunch of kids in outline. I second this suggestion, plus would like to add the suggestion to also include the alternative left/right scrolling capability. This is a commonly implemented feature within most image editing software giving better control over visual placement of the object(s) in view without specifically clicking, dragging, and dropping to a new visual orientation. For mice equipped with horizontal scrolling capabilities, obviously, use that as the input, and for the base mouse case (vertical scroll only), the [SHIFT] + scrollwheel up/down combination seems most common from my experience. For keyboard-first users, the Page Up / Page Down key command combinations would beneficially expand the as-is capabilities of up/down/left/right arrow keys which shift the focus indicator from one thought to another in the thought hierarchy. PS, this feature would make the most sense to fully implement (up/down/left/right) for Outline and Mind Map view modes while up/down only would make sense for the Normal view since Normal view centers the thoughts and disallows expansion out into the left/right directions. PPS, it also might make sense to allow for scroll distances to be user-configurable parameters (vertical & horizontal) much like an OS mouse settings since these inputs will be noisy / inconsistent from one OS configuration to another.